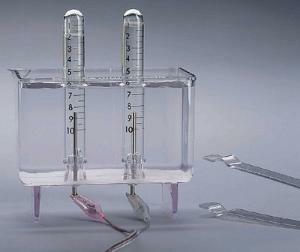 Here is an inexpensive way to conduct electrolysis experiments. Each apparatus includes a clear plastic tank (12 cm x 8 cm x 10 cm) with two protruding electrodes, two glass test tubes with graduated markings, and a plastic test tube holder. With the Genecon generator as your power source, this apparatus can be part of a successful lab demonstration.